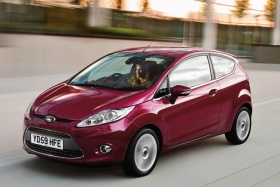 Fiesta sales in March were the highest ever for a Ford vehicle in one month. Ford Motor Co. today said its European new-car sales grew 16.1 percent in March, making it Europe's top-selling brand for the month -- but the automaker asked governments to consider new incentives to maintain sales following the ending of scrappage subsidies in key markets. "Ford has had a great March and first quarter sales performance, but we can expect some further challenges in the months ahead as more scrappage schemes are phased out," said Wolfgang Schneider, Ford of Europe's vice president for legal, governmental and environmental affairs. "Governments helped the auto industry to master the crisis last year but the crisis is not over," he added. Schneider said that by the end of May scrappage programs will have ended in all western European markets. While Ford does not expect such schemes to be renewed, Schneider said governments should consider other sales incentives such as VAT reductions and other tax breaks to encourage small and medium sized enterprises to buy new vehicles. "Tax breaks for commercial vehicles would not only benefit smaller companies but the wider economy and automotive industry as well," he told journalists in a conference call. Roelant de Waard, Ford of Europe head of sales, said the automaker expects the total market for new cars in western Europe to fall significantly to between 13.5 million and 14.5 million in 2010, compared with 15.85 million last year. Ford said sales in its 19 main European markets increased for the 10th consecutive month by 26,700 to 192,500 in March compared with the same month in 2008, making it Europe's best-selling brand for the month. For the first quarter Ford with sales up 9.1 percent to 391,100, Ford is Europe's No. 2 brand by sales after Volkswagen AG. Ford's March sales were helped by a boost it the UK, its top European market, where sales grew by 10,300 to 72,700. March is usually a strong sales month in the UK as many consumers buy cars as a new annual number plate comes into effect. Ford's sales in Germany, its No. 3 market after the UK and Italy, fell by 8,400 units to 22,000 in March, a hangover from the ending of the country's scrappage scheme late last year, which brought forward car purchases. European sales of the Fiesta subcompact at 68,800 in March were the highest for any Ford model on record in a single month in Europe. De Waard said: "The Fiesta continues to be an outstanding performer for us with 140,400 sold in Europe during the first three months of the year, and close to 70,000 sold in March alone. Globally, we've now sold over 750,000 Fiestas since the latest generation model was launched almost 18 months ago." Ford's market share in March in its main 19 European markets was at a 12-year high of 10.4 per cent, the company's best share since August 1998.